Sixty Mississippi State students, faculty and staff are 2016 selections for exceptional research and leadership honors. Assistant Professor Emily McGlohn and I were pleased to be among the honorees for our work on energy efficiency in low-wealth housing in Greenwood, MS. 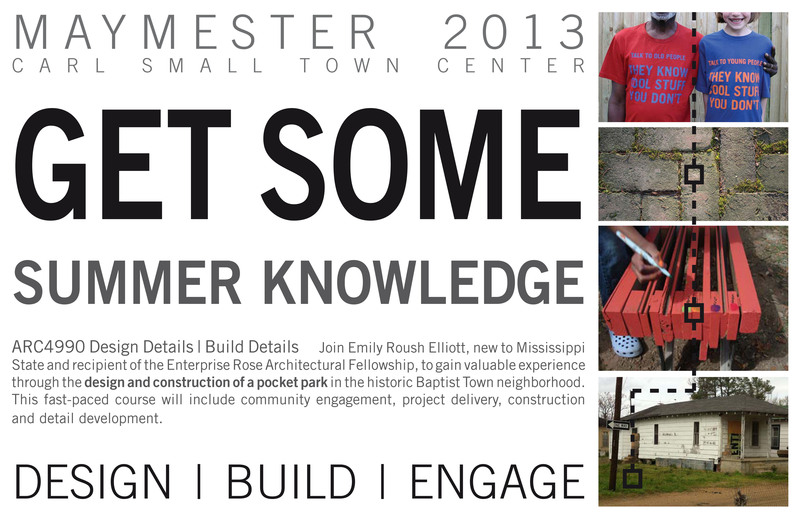 The Carl Small Town Center, based out of Mississippi State University’s College of Architecture, Art + Design, is one of my hosts throughout this fellowship. Their advice and expertise is already providing invaluable support, and I am excited to give back to the school this May as an instructor. Public design will be the focus of this hands-on course that will result in a pocket park in the Baptist Town neighborhood. As I prepared a presentation to introduce myself and the course to Mississippi State students on Friday, I was reminded of how I initially became interested in public architecture. Though I didn’t realize it at the time, the projects I experienced first-hand while studying abroad in South America still inform the way I think about the role of architecture in the public realm. Thank you to my long ago professor Claudio Vekstein.